Get tactical with the UTG Laser / Flashlight Combo. 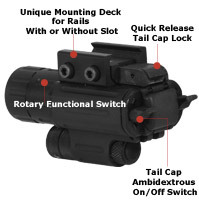 It attaches to any standard weaver rail and is small enough to stay out of your way and fit on pistols and other compact rail systems! Illuminate your target in low-light conditions or place the menacing red laser on him to let him know you're serious! Don't forget to add the Laser Pressure Switch below!